23-JUL-2013: Sims will stop tasting nectar from racks autonomously when there are too many served glasses of nectar on the lot. 12-JUL-2014: Sims serving nectar from bars will now choose to place the serving tray on the bar itself (providing there is free space for it) over other surfaces. This mod replaces the default nectar glasses with the round cocktail glasses from Late Night or Island Paradise which was the closest thing to a wine glass I could find existing in the game. Nectar served with this mod also comes in a variety of colors depending on the fruits used in it, unlike the dull colorless liquid in the default glass. Initially all I thought I needed to do to alter the nectar glasses was to override the objects files with the ones I want - which worked, but the two different glasses had different holding and drinking animations which had to be altered as well (I thought it could be ignored at first... until my test sim started smashing their glass INTO her face repeatedly) Problem was that nectar glasses and professional bar drinks use totally different drinking interactions/animations so just changing the model of the glass wasn't cutting it. So instead the mod introduces a custom glass to the game - a round cocktail glass containing a fake drink that gives the sim drinking it the effects of drinking nectar. (i.e. a nectar glass disguised as a professional bar drink in look and function) Then I altered the interaction sims use to serve nectar from bottles and nectar racks to pour the nectar into the new glasses instead of the default ones. 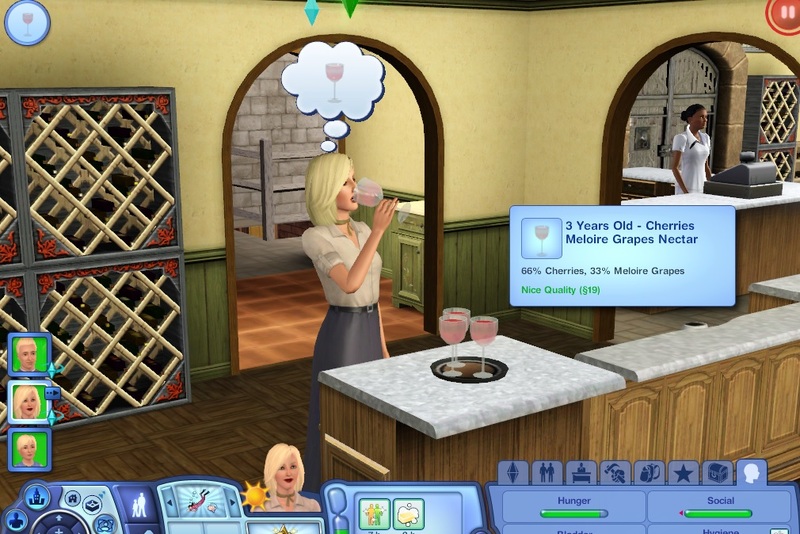 Do note that the interactions sims use to drink from the original nectar glass and the new ones are totally different now. With the original drinking interaction sims will try to find a place to sit and finish drinking the glass in a couple of continuous loops. The new glasses use the same drinking interaction as professional bar glasses where sims drink from the glass at irregular intervals between which they are free to walk around and socialize etc. The original interaction supposedly uses different drinking animations depending on the sim's Nectar Making skill (to reflect their level as a connoisseur? ), but these animations are no longer used for these new glasses. 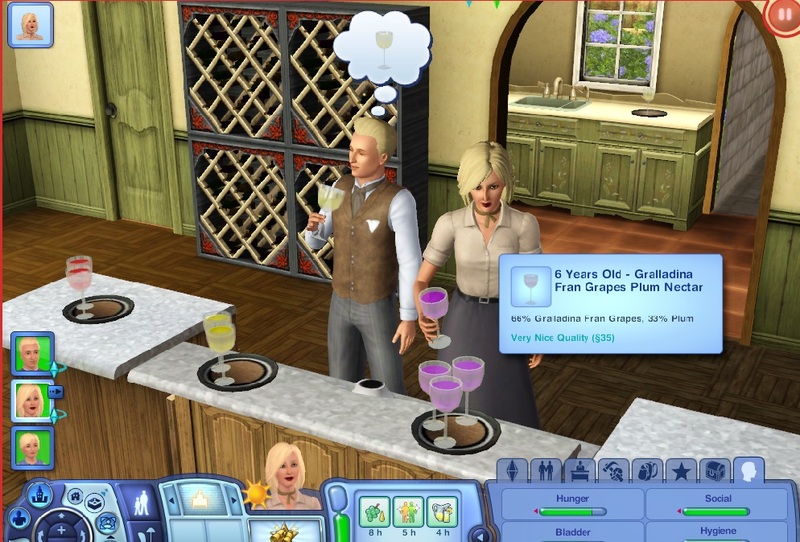 Sims will instead react to the nectar like they would when drinking a mood drink from a professional bar, depending on the quality of the nectar instead. Also when sims pour nectar there will be some clipping between the bottles and the new glasses due to them being taller than the original ones. Since the round bar glass model can be changed to have different drink colors I thought I'd have a little fun with the mod and use this to give nectar some color as well (although in the pouring animation the liquid coming out of the bottle will always be red, despite the original nectar liquid being totally clear due to *coughs* EA's laziness *coughs* some reason. Only 5 drink colors are available in game, namely Red, Orange, Yellow, Purple and Green. I've included an XML in the mod that tells the mod which color to assign which fruit, so you can use S3PE to edit it to your liking. (The fruit are listed by the "Ingredient Key" values according to the Ingredients XML in the GameplayData package and ccmerged) By default every fruit from the game from every expansion and store set should be listed there so you can shuffle them around or remove them from the list altogether (If the game can't find a certain fruit in any of the lists that fruit will simply not contribute to the color calculation). If you have a mod that introduces custom ingredients that you want accounted fo, just add the the "Ingredient Key" of that ingredient (which you should be able to find within an XML in the mod that adds that ingredient) to the appropriate color list in the XML. Requires World Adventures AND Late Night OR Island Paradise for the round cocktail glass. If you have Island Paradise but not Late Night, the proper holding animations for the cocktail glass are missing so sims will instead hold the glass as if it were a regular glass (which is noticeably off but is the best I can do). They will still drink from it correctly though.